The early eye pedestals dating from around 1830-40 bear the name S. Green 2 Union Place Lambeth. 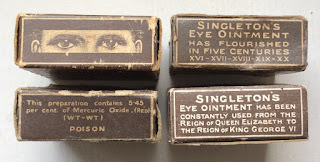 The earlier Singleton's pedestals carried the name Singleton's Golden Eye Ointment, thereafter the word "Golden" was dropped, probably around 1899. 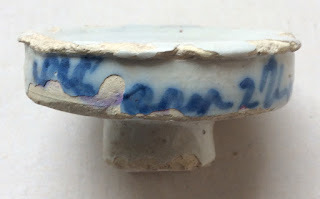 Pot shapes changed over the following years with the "foot" reducing in height size. All the pedestals carry lettering in blue print and vary in width and height sizes. 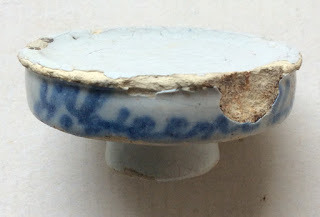 The ointment itself was placed on top of the pedestal and covered with a wax paper seal to preserve the ointment. These were distributed by the producers in a cardboard box, several examples of which are shown below. 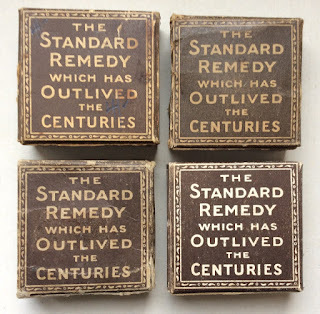 I have provided the history of these ointment pedestals following the picture gallery below. I have as part of my collection, an 18 page booklet produced by Stephen Green Ltd entitled How to Preserve Your Eyesight. The front and back covers are shown together with the Directions for use which appear inside the front cover. Below the following pictures you will find some information which I have extracted from the booklet. The booklet is stated as being the 7th edition and bears the year 1930 on the front cover. 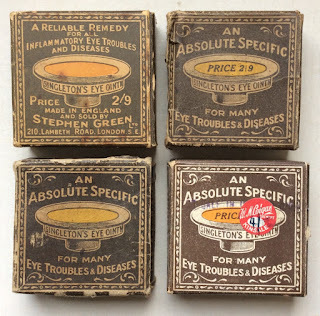 We give below the story, from A.D. 1596, of Dr. Johnson's Golden Ointment, which has for the past two centuries been more popularly known as Singletons Eye Ointment. 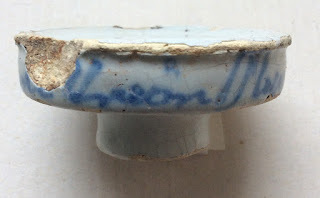 At Vauxhall, in the parish of Lambeth, Dr Johnson practiced in the reign of Elizabeth as a physician, and was the inventor of the celebrated and unique medicinal preparation now known as Singleton's Eye Ointment. Thomas Johnson was M.D. Oxford, Botanist and Royalist. He was the translator of the works of Ambrose Pare, physician to the French Monarchs. Henry III and Henry IV, and Louis XIII, which were published in 1647. Doctor Johnson died in 1644 from the effects of a wound received at the defense of Basing House during the civil war. The botanical genus "Johnsonia" is named after him. At his decease, Doctor Thomas Johnson, by will, left the recipe to George Hind. George Hind's son, Williams Hind, was the great grandfather of William Singleton, during whose proprietorship the Golden Ointment first became widely known. William Hind, the grandfather of William Singleton, gave the recipe as a marriage portion with his daughter on her marriage to Thomas Singleton. They went to reside in the house in Lambeth Road, built the year 1692, near the Archery Butts, in St Georges Fields, called Lambeth Butts, which, in 1780, was the meeting place of Lord George Gordon and his 80,000 Protestant Associationists. 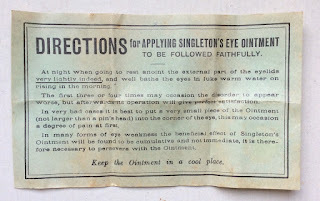 The manufacture of the Singleton's Eye Ointment as been carried on down to the present day in the same old house just mentioned. during the campaign against Napoleon Bonaparte. 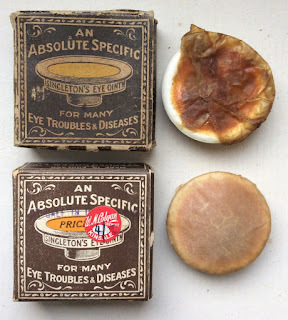 Large numbers of British soldiers whose eyes had been injured by the hot desert sand of Egypt were perfectly cured by its use. William Singleton settled the right and recipe on his only child, his daughter Selina, on her marriage to Timothy Folgham. Selina Folgham who died January 10th 1816, left the recipe by Will to her five children, share and share alike. 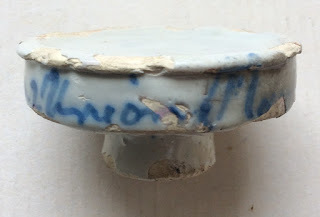 It was about the year 1804 that the porcelain pedestal pots were first made expressly for Singletons Eye Ointments. One of these pots was subsequently acquired by Sir E.W.Franks, K.C.B., for the Franks collection in the British museum. which was made an order in Chancery. William Singleton Folgham died July 26th, 1826 (vide the Singleton family tomb). 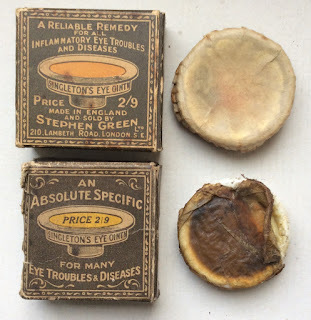 In 1825, Selina Folgham, the holder of the recipe for Singletons Eye Ointment, married Mr Stephen Green. Her one fifth share thereof being the subject of her marriage settlement. She was the great grand daughter of Thomas Singleton, and at her death, March 13th, 1831, the one fifth share became the property of Mr Stephen Green. For a large consideration she purchased the rights of the next two children, the fourth and fifth being wards in Chancery under a commission of lunacy. An annuity for each one of them was arranged, and these annuities were paid until their death in the year 1879. 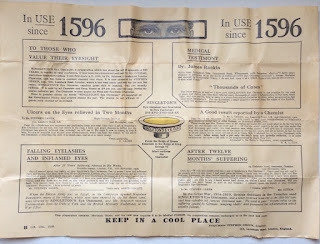 From the year 1848, Mr Stephen Green became the sole and entire proprietor of the recipe and emoluments thereof. now deceased. His. personal representatives now hold the recipe and continue the manufacture of the old remedy. 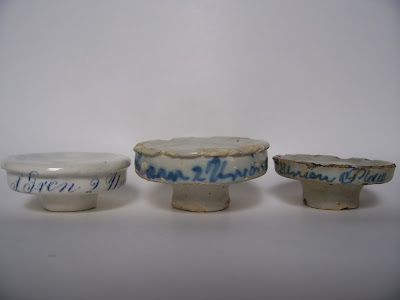 Further detailed information regarding these eye pedestals can be obtained from the Historical Guide to Delftware and Victorian Ointment Pots book produced by Messrs. Houghton & Priestley, pages 126 to 128.